We would like to better present our partners in European School for Interdisciplinary Tinnitus Research by providing some information about their contribution and hearing some of their voices towards Tinnitus and the ESIT project. Today we start with one of our industry partners. BEE Group AG, situated in Switzerland, is home to leading companies in the emerging field of advanced uses of the electroencephalogram (EEG) for medical applications. They contribute to diagnostics by discovering, approving and validating EEG biomarkers, also called neuromarkers, as well as tools to utilize the so-won information. They are developing clinical devices and software for neurofeedback for therapy measures. We are looking forward to a successful collaboration! Our press release is out now! Read about ESIT, our partners and aims! 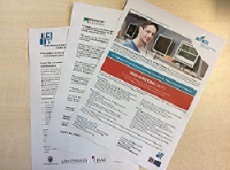 In german on ESIT Press release german or the international english version ESIT Press Release. We are proud to announce our first job offers for PhD positions are online! Join our team at the GENyO Lab Granada to learn the latest knowledge on genetics and investigate variants in cases with Menière's Disease that have very severe tinnitus. carrying out empirical studies on chronic tinnitus patients, combining auditory stimulation with repetitive transcranial magnetic stimulation. The Bavarian Research Alliance helped us a lot to apply for this Marie Skłodowska-Curie action and advised us throughout the whole application process. Without their help, the ESIT application would not have been possible. Special thanks to Dr. Rosi Hermann and the whole team! 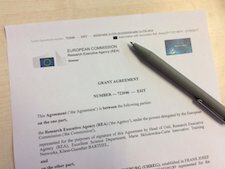 We are happy to announce that we got the last signature on the ESIT grant agreement just before easter 2017. As an intermediate result, the project is now ready to start! The job announcements of the 15 PhD positions will be stepwise published by us any time soon. Please stay tuned and follow us on our new social media channels on facebook or twitter. This project has received funding from the European Union's Horizon 2020 research and innovation programme under the Marie Sklodowska-Curie grant agreement number 722046.